View of Exeter showing the 'New Bridge' over the River Exe and houses either side. 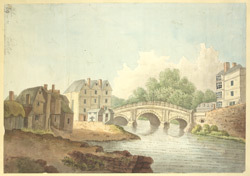 During the Middle Ages, Exeter had a single bridge to serve the town. It was constantly damaged and repaired and improved many times. By the late 18th century the medieval bridge could no longer cope with the vast increase in wheeled traffic. In 1770 a new bridge was built by Joseph Dixon in a new location, but unfortunately by 1775 it had been destroyed. Between 1776 and 1778 another bridge was constructed by John Goodwin, this time on solid rock foundations. This is the bridge seen here, which has three wide arches and a balustrade, typical to many late 18th century bridges.